Don’t wait for stories to appear in the store when you can become a member of Wheelbase Media’s weekly news service and save more than 50 percent while gaining instant access to the new features as they’re produced. He grew up helping his father repair bicycles in the little Japanese town of Komyo. By age 22 in 1928 he has opened his own store. At the same time, Honda began racing anything he could get his hands on. But a violent crash a few years later convinced him it was time to focus on his work. 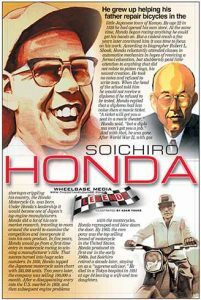 According to biographer Robert L. Shook, Honda reluctantly attended classes in automotive mechanics in hopes of receiving a formal education, but stubbornly paid little attention to anything that did not relate to piston rings.